Yesterday, I was able to attend my first A Saturday With Sherlock Holmes program at Baltimore’s Enoch Pratt Free Library. This year was the 35th edition of the program, which is conducted by members of the Six Napoleons of Baltimore, the Carlton Club and Watson’s Tin Box and was chaired by the WTB’s Beth Austin. While researching on the internet, I have come across many images of the illustrations for the Strand version of The Three Garridebs, but I have never come across any images from the Collier’s version of 3GAR, which was published on October 25, 1924. On Friday, I had remembered that while reading the recent book, Sherlockian Saturdays At The Pratt, which can be purchased here, editor William Hyder commented that the Pratt had displayed copies of many of the Collier’s magazines at past programs. I contacted the Pratt and made arrangements to view the issue after the program had finished. I headed down to the Periodicals department after the program ended on Saturday, and they had the volume set aside for me at the desk. I had forgotten how much magazines have shrunk in size, much like newspapers, over the last 90 years. 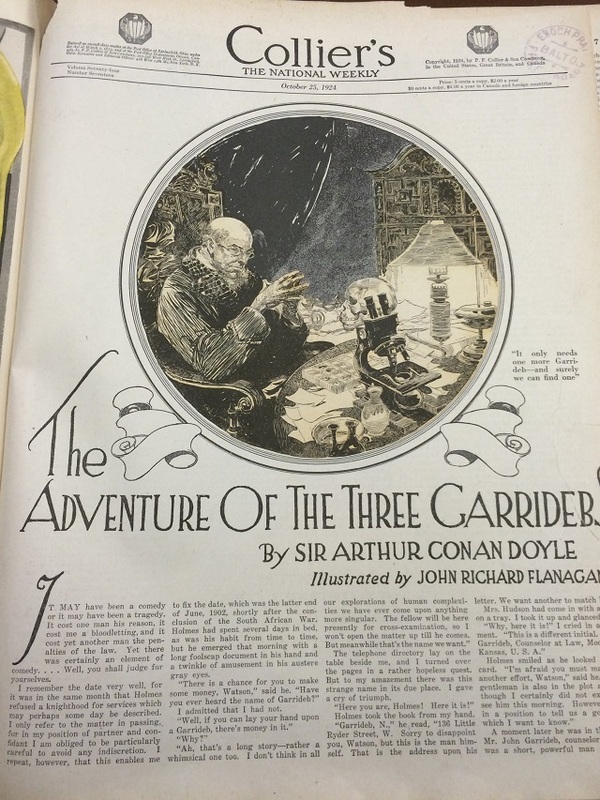 There are three illustrations by John Richard Flanagan for the Collier’s version of 3GAR. 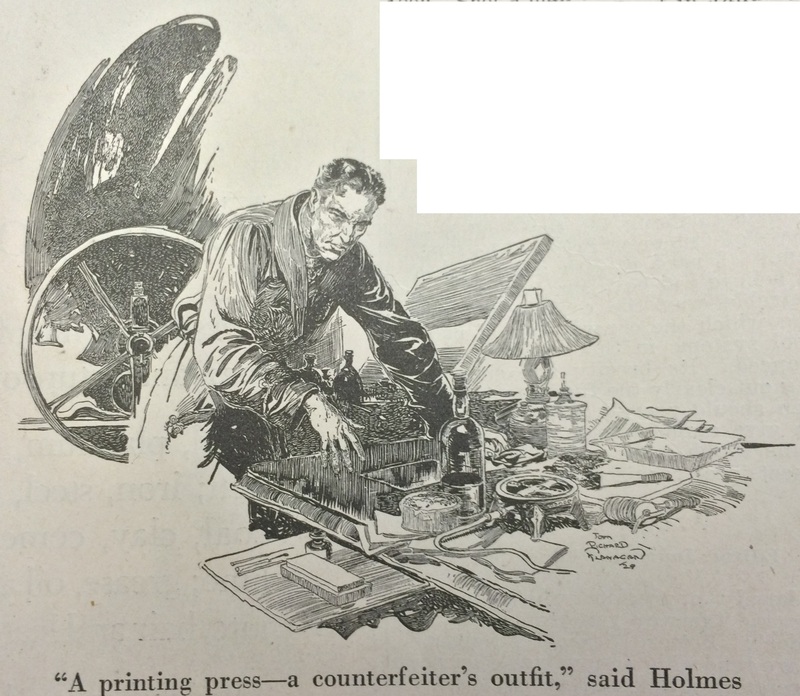 I imagine that these same illustrations were utilized when this story would appear in the December 1924 issue of Current Opinion magazine. The second illustration is centered in the middle of the two pages, hence the split image. I really like the illustrations that Flanagan did for this story. 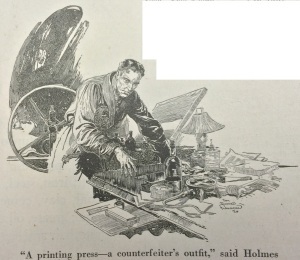 Two weeks later, in the November 8, 1924 issue of Collier’s, he would produce four illustrations in The Illustrious Client. 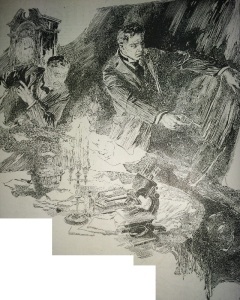 These would be the only two Holmes stories that Flanagan would illustrate. Not much is known about John Richard Flanagan – heck, there is no Wikipedia page for him…. 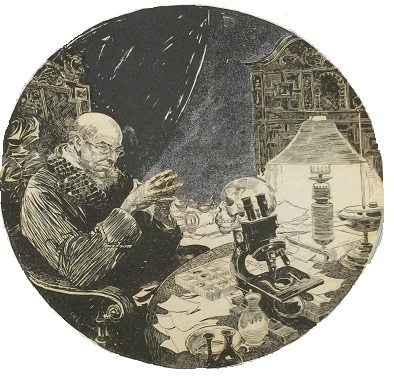 He was born in Sydney, Australia in 1895, attended classes at the Royal Arts Society of New South Wales and would leave for the United States in 1916. His works graced the pages of Collier’s and Cosmopolitan and did work for comic books, primarily Action Comics. He passed away in 1964. Please check out the post on the Collier’s magazine cover for this adventure here. My thanks to Meg Gers of the Periodical Department of the Enoch Pratt Central Library for her assistance in this project. 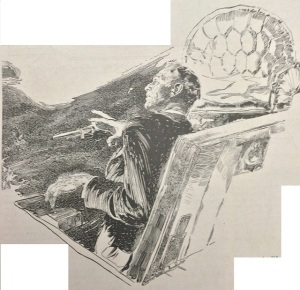 All rights of the illustrations in The Three Garridebs remains with the copyright owners of that story, and in no way does The Fourth Garrideb claim or imply ownership of those illustrations.